A friend and I had tried to find a date to get together. Monday afternoon happened to be the only time she had available any time soon. I said, “It’s Memorial Day. We should do something, and if it’s hot let’s spend time in the creek to cool off.” Meanwhile, my naturalists group had traveled to the Green Swamp, where I felt a deep sense of loss of the once-vast, gorgeous longleaf pine landscape and of the big, ancient cypress trees of the swamps (see Brunswick post). Last night I listened to a recording by my teacher, Daniel Foor, giving a talk about animism that, synchronistically, happened to be on Extinction, Grieving and Opening the Heart. Daniel said that the sacred beings whose bodies are nature can be our companions, our witnesses; the earth and water can hold us when a human community isn’t around to support us in our grieving. He led us through a water ritual that seemed it might be the perfect “something” for my friend and I to do at the creek. Today is Memorial Day. 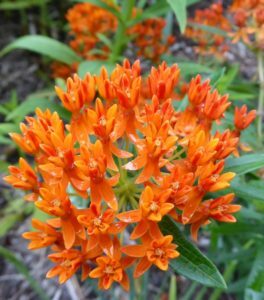 In the morning, at home, the orange butterfly weed is in full bloom, the pink swamp milkweed is starting to open. There’s a soft, light rain. 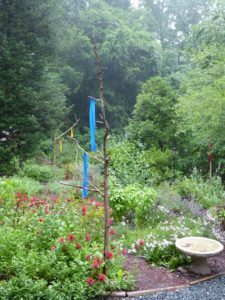 Watching the raindrops make splash patterns in the birdbath, I notice that a monarch is taking shelter from the rain by hanging below a twig on the new cedar pole that represents the direction of West, the element of Water, in the Medicine Wheel. Wet milkweeds. 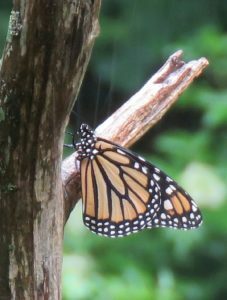 Wet monarch. In the afternoon, at my friend’s house, it’s raining harder. Instead of going to the creek we will do our Memorial Day grieving ritual using water from our New Hope Creek watershed wells. She has picked mulberries. We swing for awhile, side by side on her open porch, catching up with each other, listening to the pattering rain, sipping mulberry juice, nibbling the fresh berries. We set up our ritual space on a table on the porch so that we can be surrounded on three sides by the straight and steady rain. We stand on opposite sides of the table, she looking out towards the rainy woods in one direction, I the other, our bowls of well water in front of us. From a medicine bundle she brings out a candle and a red cedar smudge. We purify each other with the fragrant smoke. She calls to the surrounding Directions in Lakota. I lead us in praying aloud to the spirit of the water, asking it to hold our grief. 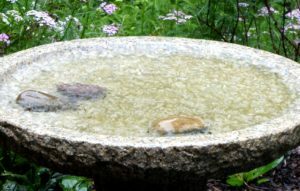 We add a little honey to our bowls of water to sweeten our offerings. (Could have been mulberry juice or a few of those ripe mulberries!) I add to the water my sweet praise and salty tears of grief for the loss of the beautiful and intricately woven habitats of the longleaf savannas. She prays her grieving and her appreciations for nature beings she fears losing. I add more tears of love and sadness for the ancient cypress elders and send blessings to the people who are trying to protect those that remain. We thank the waters for holding our tears and stand for a moment, listening for a message from the waters or from the ancestors. She is moved to sing a soft, meandering song to Water. I start a rousing round, sending strength to the Trees: Trees grow tall in the heart of the forest. High as the sky, and their roots grow down in the deep, dark, earth. We will each return our bowls of tear-water, with gratitude, back into our rain-swollen creeks, hers into New Hope Creek, mine into Buck Branch, a tributary. Both flow into the New Hope River and from there into the Cape Fear, which opens graciously wide to the ocean. It is comforting to know that Mother Ocean will receive our tears, our hopes and our fears for our beloved forests, with compassion. Thank you for sharing this sweet memorial offering. It is a reminder to open up my eyes, ears, arms, voice and heart in a deeper way to express my joys and longings with nature companions all around me, in a regular and sacred way. Yes, Robin, let’s all help remind each other to open our senses, our voices, our loving hearts to the sacred beings with whom we share this beautiful world. I know I sure need reminding – to open my curiosity and play more in nature, too, as you teach!